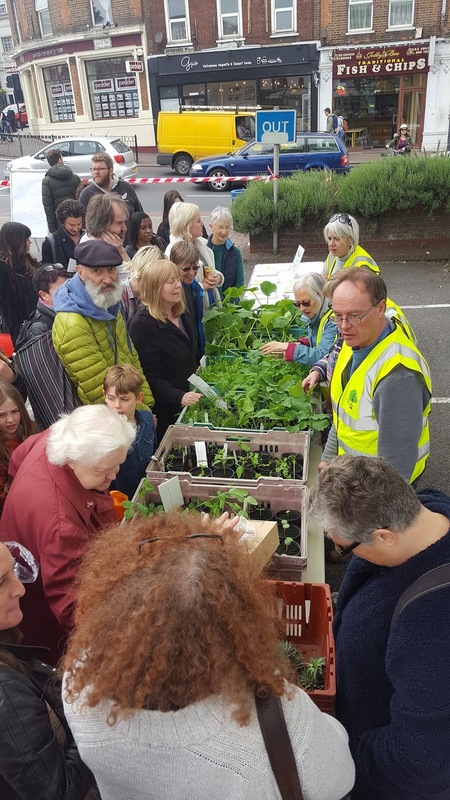 A selection of edible plants, grown by the Horniman Gardens and surplus to requirements, will be given away by volunteers from the Forest Hill Society. nesting colonies in Wynell Road (off Perry Vale), Kilmorie Road, Lowther Hill and Devonshire Road/Tyson Road. Swifts are small, fast and agile with a distinctive silhouette. They are often seen in groups circulating high in the sky and have a distinctive 'screaming' call. They are migratory birds, flying from Africa to northern climates where they nest and raise their young, before flying back to Africa. Amazingly, swifts spend most of their lives flying and never land, other than to nest. They even sleep whilst flying! Swifts have adapted to nesting in buildings, not trees, which means cities are ideal nesting grounds. However, swift numbers have declined dramatically because their existing nests are under threat from building renovation, and there are few alternative nesting spaces in modern buildings. Swifts depend on gaps and small holes high up in buildings, for example under eaves or behind gutters. But as houses are repaired these holes and gaps are blocked up and swifts lose their nesting places. Each swift pair return to the same nest every year. Unfortunately if their nest has disappeared they cannot breed unless they find a new site, which is difficult because modern building design does not provide nooks and crannies. 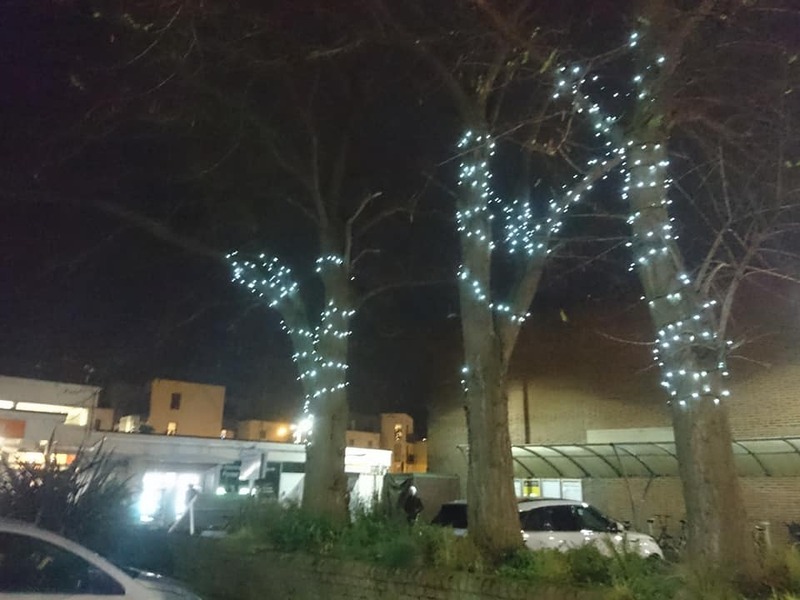 A local swifts group (known as Lewisham Swifts) was created by Rebecca Headd, a Forest Hill resident who wanted to protect her local swift colony in Wynell Road. The group, which aims to raise awareness of swifts and tries to protect and extend nesting sites to increase the swift population, has now grown to cover the whole borough. Lewisham Swifts maps reported swift sightings across the borough. This forms a picture of where swifts might be nesting and is also a way of encouraging people to take an interest in the birds. Last May, ten swift nest boxes were installed on the side of a block of flats in Wynell Road by the London Fire Brigade, who used it as a training exercise to use their ladder platform. The boxes are visible from the top of Wynell Road at the junction with the alley, so passers-by can keep an eye out to see if any swifts take up residence. Saturday 4th May, 2:30pm at Forest Hill station’s forecourt. Possibly with some music to enjoy too! Many people are bothered by noise from aircraft heading over our area to Heathrow and London City airports, though research shows that the decibel level and frequency of aircraft at which people become significantly disturbed varies. Surely, some aircraft noise is part and parcel of living in London? When planning huge expansions, airports are under environmental pressures as expectations rise for less noise and pollution. 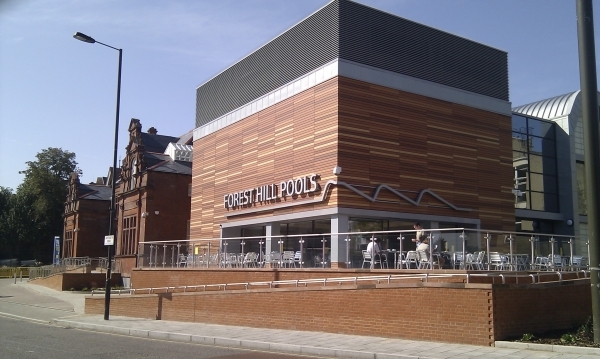 How then should Forest Hill ensure that its interests are taken into account? In August 2018, I published a report on aircraft flying over our area, entitled No respite from aircraft noise in SE23. 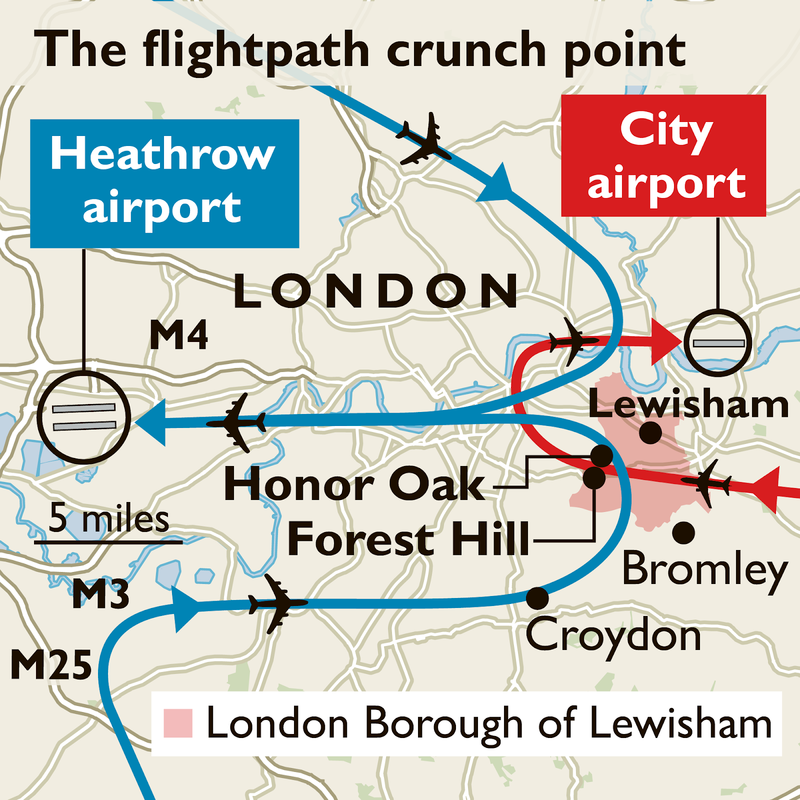 This explained how two airports, Heathrow and London City, combine their aircraft’s flight paths over Forest Hill, with each airport’s planes flying different paths and changing flight direction in different wind conditions. One of the report’s surprising findings was that south east London was unique in getting this double overflight situation; there was never a day when we did not get either one airport or the other’s planes, and quite often we get both at the same time. The Times picked up on this recently, name-checking Honor Oak and Forest Hill when the London Assembly reported on the issue. 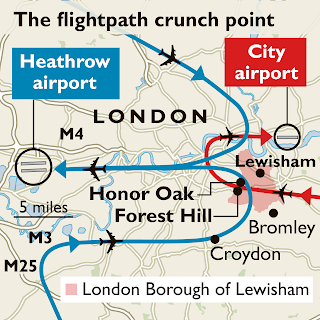 London City airport controls the lower-level airspace over Forest Hill. In February 2016 residents along a line from Sidcup to Catford, Forest Hill, Dulwich, Herne Hill and north to Vauxhall noticed a sudden change: Aircraft that were previously dispersed were now flying along a very precise path over the same homes and schools at or under 2,000ft. People living under this relatively new low-altitude concentrated route are now affected significantly worse than before. Until 4th March Heathrow is running a huge consultation, the first of several, on a complete redesign of the higher -level airspace they control over London. A third runway is planned for 2026 and, whether or not it is built, the airspace that has evolved piecemeal over 70 years will be redesigned. We’d like to see regular breaks from aircraft noise for all communities, planes flying higher for longer and an end to the crossing of flight paths above us. 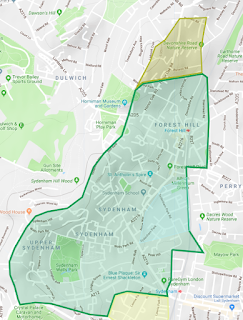 We'd also like to make sure that the voices of Forest Hill and neighbouring south east London communities are heard on plans that affect us. Each individual can make a small difference by participating in consultations and by complaining, when disturbed by noise, to airports. Aside from our overflight issue being noted by The Times, it has also been acknowledged by London City airport, which has for the first time carried out some initial noise monitoring in our area; and by Heathrow airport, whose consultation specifically mentions the need to address the double overflight situation. 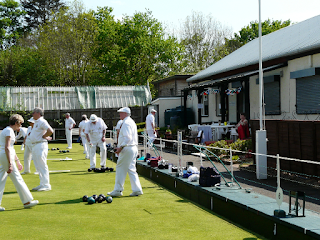 The Forest Hill Bowling Club is celebrating its 125th Anniversary this year, and they will be hosting three Special Celebration Matches plus other events throughout the summer season. Bowls is a sport and pastime for everyone. You can make new friends at the Club and spend summer afternoons and evenings in safe and pleasant surroundings. For those who have not bowled before or who have limited experience, the Club can provide the assistance of its qualified bowls coaches. Their outdoor season starts on Saturday 20th April and runs until Sunday 22nd September. From the beginning of May, they meet for practice, skills and coaching on Tuesdays and Fridays at 5pm. 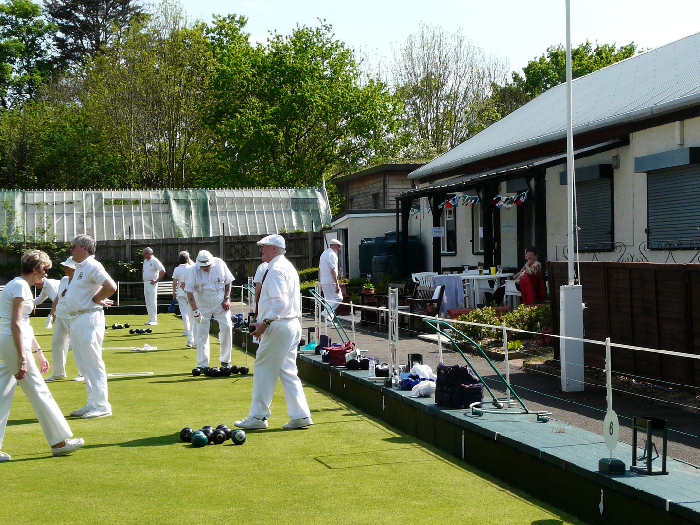 The Club’s members play matches on Wednesday afternoons, Thursday evenings, and Saturday and Sunday afternoons. Why not pop along to try bowls for yourself? You may have noticed something new at the Horniman Museum and Gardens in late 2018. The museum is one of twenty well-visited locations chosen by the Mayor of London for the first wave of new public water fountains that provide free access to healthy tap water for refilling water bottles. This is part of an effort to reduce the more than 20 million single-use plastic bottles that Londoners consume every week, many of which end up in landfill or polluting the environment. 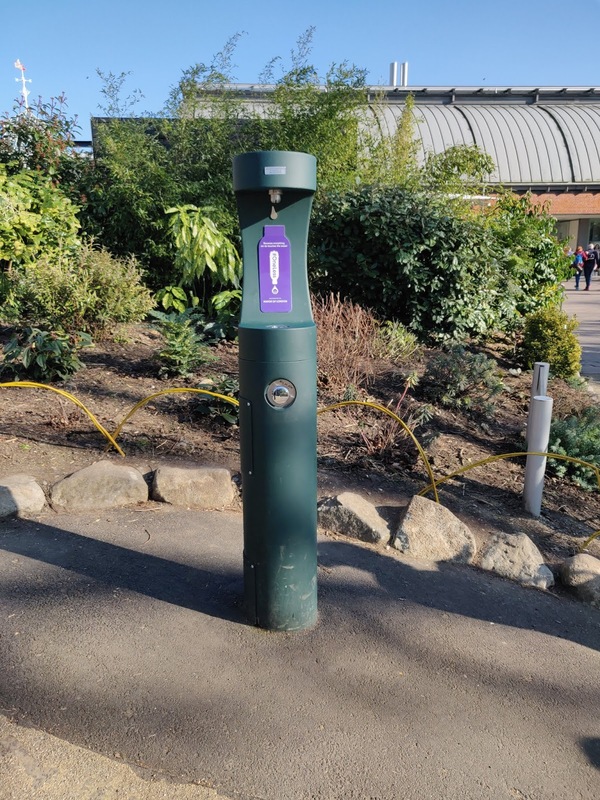 We think this is a great initiative and would love to see more of these bottle-filling fountains around Forest Hill. Between 1810 and 1819, we tragically lost our very own ‘jewel’, a 500-acre common, in a lengthy process of enclosure. This would take away access to our natural landscape, and a way of life, permanently, and set the course for the eventual creation of the suburbia we recognise today. To contemplate this loss requires a leap of the imagination, as it seems there are so few clues left until you start to look for them. When you next pass The Greyhound pub in Sydenham, be sure to read the interpretation plaque that accompanies the large mural facing Sainsbury’s. However, if you stand in Sydenham Wells Park, you can experience the gentle undulating hills which once characterised the common, a space about 25 times larger than the park. Just imagine the park before its neat horticulture, where animals grazed and some ramshackle buildings provided shelter; you might capture something about Sydenham Common, which was previously called Westwood Common. lady-in-waiting to Princess Caroline, and keeper of an anonymously published series of diaries, among which records the first known written encounter with William Blake. She lived nearby in the mansion house called Westwood House, for whose earlier owner a fine grove of Elms were planted in an avenue, leading toward the centre of the mansion, that today we know as Jews Walk. In what seems like an improbable twist, Eleanor Marx, who would live in Jews Walk much later, is also descended from the House of Argyll — which we know because Karl Marx was questioned by police when he pawned his wife’s silver. The crest of the house of Argyll was identified on the silverware and Jenny Marx had to explain that her great-grandmother was a Campbell. These little vignettes transport us back to a completely different age, yet something recognisable to visitors of Hampstead today. The thought that we, in south east London, had lost the equivalent of something like two-thirds the size of Hampstead Heath is lamentable. But the works, letters and diaries of contemporaries mean that we can piece together a substantial picture of life in Sydenham and Forest Hill at that time. We can verify many of the described locations by cross-referencing them, and plotting them by using online maps spanning the last two centuries. 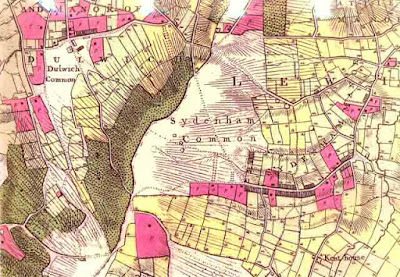 We are living with the paradox that, if we piece together the evidence, we would come to know more about life around Sydenham Common than would have been known to its most observant and well-connected residents. The capability of Wikipedia to provide this type of evidence has been a sea change in the fortunes of local historians. We can be grateful to the voluntary contributors to Wikipedia and reflect on the fact that it is founded on a model called ‘Creative Commons’, which itself draws from the original traditions of commoning, showing the reinvention of this deep-rooted need. 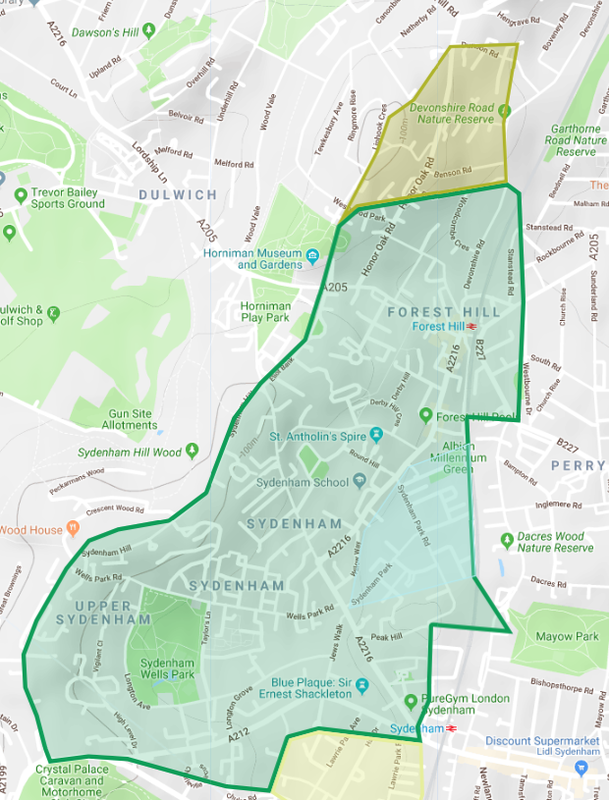 In July 2019 London will be designated as a National Park City, exactly 200 years after the final enclosure of Sydenham Common. 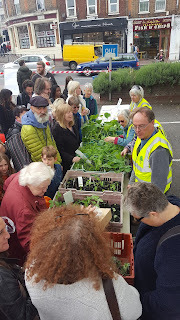 The Forest Hill Society had the pleasure of hearing campaigner Daniel Raven-Ellison talk to us at our last AGM, describing the genesis and development of this astonishing idea. I think Forest Hill and Sydenham should seize this opportunity to celebrate the launch of London National Park City and commemorate the Common by promoting the understanding of, and access to, nature. One month beforehand in June, the London Festival of Architecture will explore its theme of ‘Boundaries’. I wonder if we can somehow work towards physically marking the historic boundary of the Common, perhaps (eventually) permanently and, in doing so, use social media to welcome in the National Park City. One special space that sits within the former Common at the very boundary of SE23 and SE26 is Albion Millennium Green, a gift from the nation. 'Albion' was one of 245 green spaces across England that was created under the Countryside Agency’s Millennium Greens scheme with funding from the Heritage Lottery Fund to commemorate the year 2000. We have been working with volunteers to secure the future of the Green and its health, and we know that to continue this we must appeal to our collective sensibilities. The Green (like the Common once before it) is something we all need to look after, for the benefit of everyone. Being located so close to Forest Hill Library and Pools, it feels like it is our own village green even though it seems so much like a secret garden. It is even used for 'Forest School' activities which combine outdoor learning with appreciating nature. The Friends of Albion Millennium Green would like to thank all our visitors, volunteers and supporters, for keeping alive such a vision — not just as a 'Sleepy Hollow' but as our very own part of "England's Green and Pleasant Land". Very soon, Dartmouth Road will welcome a new enterprise from Aga Czarnota of Aga’s Little Deli. Jason Kee sat down one afternoon with Aga to talk about her new venture, her home in Poland and, of course, cheese. Aga originally hails from Kazimierz Doly in eastern Poland. She describes a beautiful small town of 5,000 people. The town is largely untouched by war, and full of restaurants, bars and galleries. Aga studied journalism in Poland and began her career with the Gazeta Wyborcza newspaper covering a range of cultural issues, including arts and film. She came to London in 2003 to learn English while writing about London’s culture and arts scene for Gazeta Wyborcza back in Poland. She returned home for a short spell, but London was calling and Aga came back — first writing for, and helping to establish, Cooltura the weekly Polish language magazine in the UK. Culture appears to be in her genes, but it wasn’t long before food became Aga’s passion. In 2005, Aga was also working at the Coach and Horses pub in Mayfair. While there she was given the opportunity to work in the Neal’s Yard Dairy Wholesale Arch in Bermondsey. Over the next three years Aga learned the cheese industry inside and out. Aga speaks passionately about her time with Neal’s Yard, then leaving to work with Bermondsey cheese supremo Bill Oglethorpe, now the owner of the famous Kappacasein Dairy. It was while working with Oglethorpe that Aga no doubt got her taste both for retail, working three days a week in Borough Market, and for her sense of business, working on his accounts on other days. 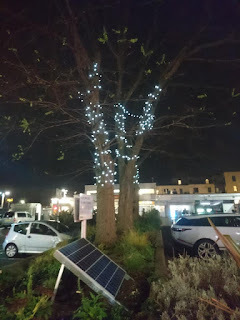 After having worked with Oglethorpe for four years, Aga found herself at a meeting in the Sylvan Post pub which laid the ground work for the 2012 Forest Hill Society’s Food Fair in Forest Hill station’s forecourt. It’s remarkable to think that this short-lived enterprise has provided such long term benefits to the Forest Hill community. Not only did it bring about Aga’s Little Deli, but it was from here that Ruth and Nathan then opened the Forest Hill branch of the Butchery. However, it wasn’t long before Aga decided to open her first shop. “We didn’t really think about what we were doing,” Aga said, “but the whole idea was to bring Borough Market to Forest Hill under one roof, and then see what happens.” She signed the contract for 49 Dartmouth Road in June 2012 and was open for business by September. When asked why she chose Dartmouth Road, she said, “It was always to be Forest Hill.” This should be no surprise since Aga has always lived in this area. And now, with a family including two boys and one girl, her connections run deep. It is with understandable pride she speaks of the business she’s built and her contribution to the revival of Dartmouth Road. Aga’s Little Deli is a great Forest Hill success story. But one shop does not seem enough. Working with Anna Kokornacka, Aga will open a zero-waste shop and greengrocer in the former premises of Sugar Mountain at 57a Dartmouth Road. They collected the keys on March 1st and hope to open by the end of the month. The shop will champion zero waste with a range of dried goods — including beans, nuts and lentils — that will be available in bulk to take away in any size or volume. The shop will also feature “really great vegetables”, finally bringing a greengrocer back to Dartmouth Road. It will be the kind of shop Aga remembers from her youth in Karczmiska, providing a range of essentials food items for the local community. Aga is keen to note this is only a start: “We want to see what people need, listen to our customers about what they really want.” She adds this may also include a range of vegan products though is quick to point out that, while not actually a vegan shop, it will be a meat-free one. All will be revealed in a few months. So what of Aga’s Little Deli? When asked, Aga notes that her top three selling cheeses are Comte (her personal favourite), Colston Basset Stilton and Montgomery Cheddar. But she thinks more people should try her British goat’s cheeses like Ragstone and Tymsboro. While the fennel pork salami is the best-selling meat, she recommends Perinelli salami made close by, in Penge, by a guy from Forest Hill. And what could make Dartmouth Road better? “Longer parking times and a fishmonger,” said Aga. The Forest Hill Society wishes Aga well with the new venture. Belinda Evans asked the owners of Sfizio, which opened in October 2018 at 31 Perry Vale, to tell us all about their new venture. Is this your first restaurant venture? e still going to this day. Which regions of Italy influence your food? Our menu is influenced by various regional cuisines of Italy, since the concept of Sfizio was to incorporate regional Italian food into a tapas-sharing format. As we are from Sarno — which is located near Salerno in southern Italy — we naturally wanted to bring some dishes from the area to our restaurant; our Melanzane Parmigiana and Neapolitan meatballs, which we serve in a tapas format, are both dishes eaten in Campania, south Italy. However, overall we would say our food is mostly influenced by central and southern Italian cuisines. Why did you choose Forest Hill for your new venture? 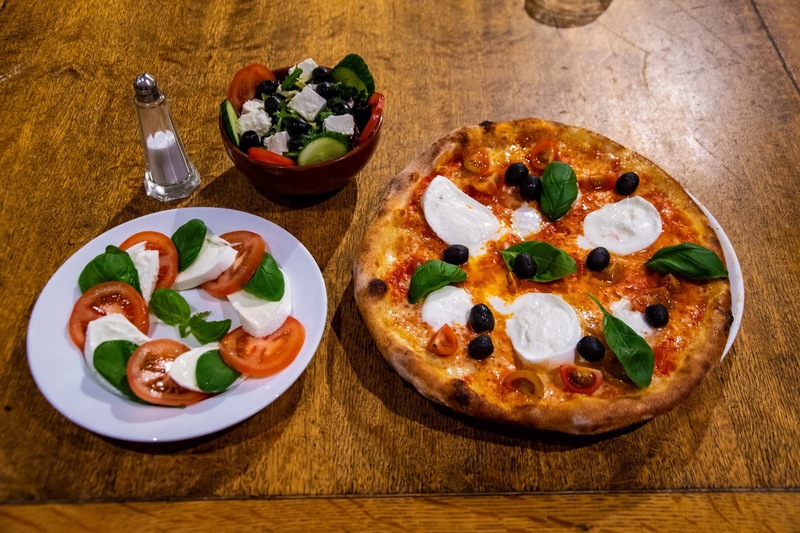 We chose Forest Hill as it is an extremely vibrant and lively area of south east London, with plenty of people who would be interested in trying our Italian tapas concept as well as our sourdough pizza. We know there are plenty of families and young professionals who wanted something different in the neighbourhood, and we wanted to properly utilise the space left behind by The Perryvale Bistro & Bar. Everyone is intrigued by the name Sfizio — does it have a special meaning? Sfizio, when translated directly, means 'on a whim'; however, this doesn't necessarily do justice to the word. Sfizio is derived from the word Sfizioso, which is usually a word used to describe an action which is different, exciting or interesting. As we were introducing a new concept to south east London — in the form of Italian tapas — we wanted to choose an appropriate word which was short and to the point; and embodied our intention to do something different, exciting and interesting by going against the grain of most Italian restaurants and by emphasizing purely traditional dishes. We are fortunate enough to have quite a few popular dishes! Our Arancini, Calamari Fritti and Salsiccia con Fagioli are all very popular. Our most popular pizzas are the Piccante Calabrese pizza with Italian pepperoni sausage and Calabrian nduja, and Salsiccia Frierelle pizza served with Neapolitan broccoli and Neapolitan sausage. We also sell a lot of our fresh pasta which we make — especially the Strozzapreti, which features Provola cheese (smoked mozzarella) and aubergine in a San Marzano tomato sauce. Our specialty dish is our Panuozzo, as it is something different to what most pizzerias in south London serve. It is a staple of Neapolitan street food — a pizza baguette often stuffed with parma ham, fresh tomatoes and melted fior di latte mozzarella. We have two variations: a Neapolitan-style with buffalo mozzarella and parma ham; and a Gragnano version which includes aubergine, fior di latte mozzarella and Neapolitan sausage. How do you choose your wines? We try to provide a variety of lesser-known Italian wines for our customers. We really believe Italian wine is some of the best in the world, and we wanted to showcase some great organic wines on our menu too. What's your most popular cocktail so far? It's an even match between the Margherita and the Fragolino. We are currently running our Aperitivo Time offer between 5 and 7pm every Tuesday to Thursday, when customers can receive 2-4-1 on cocktails. 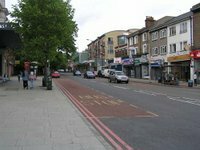 If you have time to eat out in Forest Hill where do you like to go? We really enjoy BOnA; whilst we make sourdough pizzas ourselves we really appreciate the good quality of pizzas they serve. We also enjoy The Signal pub and the Sylvan Post. On your doors you have some Italian words — can you tell us what they mean? Rillasarrsi: Relax. Gustare: Enjoy. Condividere: Share. This was the mantra developed behind Sfizio — the concept of enjoying, relaxing and sharing your food. It's at the heart of the restaurant and the experience we want to give to every customer.